A card feat that can be done over the radio. The magician shows the audience how to program their deck into a smart deck and proceeds to locate everyone's chosen card over the radio. A great publicity stunt that will get you booked on radio shows. The NTE Principle is a self-working hands-off effect that can be done over a cell phone, in a room full of people or even over the radio for thousands of people at the same time. It's an amazing effect where people select a playing card, lose it into the deck and then the magician is able to locate the card without ever actually seeing the cards. When Devin Knight was performing as a psychic, he did this trick over dozens of radio stations locating thousands of people's selected cards at the same time, which always resulted in the station's phones ringing off the hooks. Here are some of the things you can do with NTE. Call a newspaper reporter, have him shuffle his own deck of cards and select one, he calls off the cards as he turns them face upward. No fishing or pumping. Suddenly, the mentalist or magician names the card the reporter selected over the phone with no questions asked! No forces, key cards and self-working. Magician talks about smart phones and says there are now SMART CARDS which can be programmed like a smart phone. This is one of the best radio effects ever created. Thousands of listeners can use their own decks. Over the radio, the performer tells the people at home to shuffle their deck and he then proceeds to tell them how to program their deck into a smart deck. People cut off a block of cards and look at the bottom card and replace it. They are told a simple step to take to program the deck. Once they do this, they tell the deck to find their card now. They tap the top card of the deck and it is their selected card. No math to do. Everything is done in a slow clean cut manner. Cards are repeatedly shuffled during the effect. People are told to call the station if they found their cards and the phones ring off the hook. Positively amazing and will get you booked on many radio shows when you tell the producer you can find hundreds of selected cards over the radio. A tremendous publicity stunt that is easy to do and again 100% self-working. You can call anyone who has a cell phone. Tell him to put it into speaker mode and get a deck of cards. You explain to this person, how to turn the deck into a Smart Deck and proceed to find his card over the phone. Nothing complicated and easy for the person to do. None of these effects require people to add numbers or subtract numbers. No adding numbers to get a number to count down to. No chance for failure. Positively none of the silly math that screams this is a mathematical trick. Go to a dollar store and buy a dozen decks of cards and take them to a party. Let people split the decks and share cards. A full deck is not needed. Now hear this, everyone in the room selects a card and returns it to their cards. The performer explains how to give the deck a command that will make it a smart deck. Everyone then tells their cards to find my card now, taps the top card and turns it over, it is their card! One of the best audience participation effects as everyone selects a card (no force) and the performer finds them all. Magician can turn his back and never touches any of the cards, at any time. Magicians are always asking if there is good trick that can be done via e-mail. Now there is. Simply type up the procedure on how to turn a deck into a smart deck and your friend can find his own selected card and not know how he did it. Again your friend has no math to do as in other e-mail tricks. 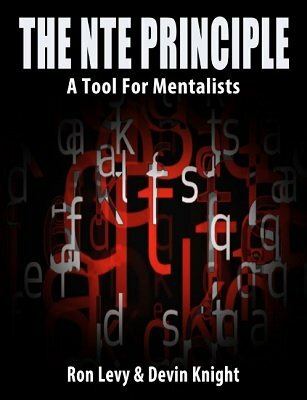 Using the NTE principle, Ron Levy gives you a wonderful trick using the principle with a regular Alphabet Deck. This is a vital tool that you will want to add to your arsenal. Nothing complicated to memorize. All explained in a simple to read and understand PDF. This is based on a Robert A. Nelson effect which in turn is based on a principle introduced by Bob Hummer.